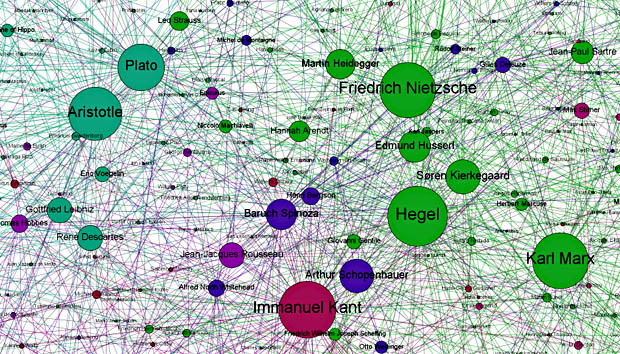 This is way outside of my usual wheelhouse, but I was sort of intrigued by this network graph of famous philosophers put together a few weeks ago by Simon Raper. (Via Sullivan.) As you’d expect, virtually all of the big circles are household names (or pretty close), and as the circles get smaller there’s a greater chance that I haven’t heard of the person. But what’s interesting is that this graph has a feature shared by a lot of assessments like this, namely that there are frequently one or two sharp exceptions: someone extremely influential who’s not only not a household name, but completely unknown to me. In this case, it’s Edmund Husserl. Never heard of him. And yet, if this graph is anything close to accurate, he’s as influential among philosophers as Heidegger, Spinoza, Schopenhauer, Hume, and Wittgenstein — and more influential than Leibniz, Descartes, Hobbes, Locke, and Mill. This seems to happen a lot. In this case I’m curious about whether it’s for real. Is Husserl one of those guys who had immense influence within his profession but is largely unknown to the public at large? Did the algorithm that produces this chart make a mistake? Or was the guy who wrote his Wikipedia entry just an enthusiast who eagerly dropped Husserl’s name into lots of other entries, thus gaming the system? Educate me in comments.